Due to security breaches in OS-level OpenSSL library distributions (e.g. the Debian OpenSSL "fix") and the general problem of old OpenSSL libraries on systems, we have chosen to integrate the most current, unpatched and original versions of the OpenSSL libraries directly with the package - on Windows and all supported Unix platforms as well as Mac OS X.
pyOpenSSL includes an undocumented tsafe.py module which wraps connection objects with a thread lock to work around the problem. Other than this limitation, OpenSSL and pyOpenSSL work just fine in a multi-threaded environment. The OpenSSL libraries use a configuration file for definition of default configuration settings, locations of certificates, keys, etc. The file is usually called openssl.cnf and searched for by the libraries in the OpenSSL configuration directory, which has to be set at compilation time. 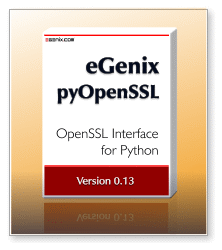 Please note that pyOpenSSL itself currently does not use the openssl.cnf file. The library is not calling the needed APIs for OpenSSL to automatically read the configuration file and doesn't expose these APIs in Python either. This may change in a future version. You can override the locations using the environment variables OPENSSL_CONF (pathname of openssl.cnf), SSL_CERT_DIR (certificate dir) and SSL_CERT_FILE (certificate bundle file). Please note that you either need egenix-mx-base version 3.1 or later, or the Python ctypes module installed for this to work. The module will fall back to the system libraries in case loading the embedded libraries fails. You can set the environment variable EGENIX_PYOPENSSL_DEBUG to 1 if you want to debug the automatic import of the embedded library files. Another option is adding the OpenSSL package directory to the LD_LIBRARY_PATH environment variable. On Windows, no additional Python modules are needed, since the linker will find the embedded libraries automatically.